View of the River Mersey, with Liverpool in the background from the Rock Perch. This was at the tip of the Wirral peninsula, which guards the entrance to the Mersey and access to Liverpool. Since 1683, there had been a wooden perch- a makeshift lighthouse here. 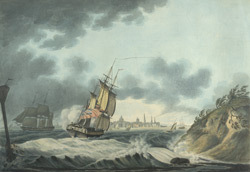 This picture shows the river traffic on the Mersey, in stormy weather. During the 18th century Liverpool had developed as a major port, by 1800, had 80,000 inhabitants. Docks were constantly built: the first in c.1709-21, Salthouse Dock in 1734, Canning Dock in 1753, George's Dock in 1767, Duke's Dock in 1773, the King's Dock 1784, the Manchester Dock of c.1785. The port was the centre of importing cotton for the Lancashire Textile industry.